Moon Crossing is the second novel in the Fellhounds of Thesk series and the follow-up to the young adult fantasy novel Moon Chase. 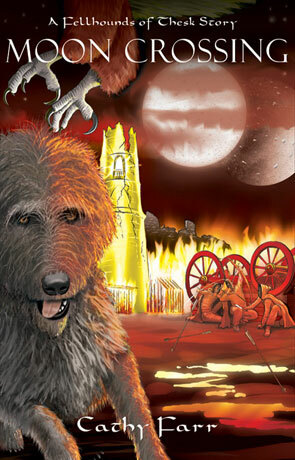 We are once again joined with Wil Calloway and those huge Fellhounds and this time its to rescue one of Wil's friends, continuing on from the cliff-hanger ending of the first. There is a wonderful charm that permeats the pages of these books, helped by depiction of the huge, friendly hounds and the interplay between Wil and his friends. The novel feels very much like a continuation of the previous book with the same crisp, clean narrative and uncluttered dialogue that comes across as friendly and warm. The author wastes no time on back story or too much world building and instead we are launched straight into the story, which is not only very well written but quite engaging too. The pace is set just right, there is enough time taken with the interplay between the party of adventures but not too much that prevents the story moving forward. The real strength lies in the characters though and here the author really does excel with living, breathing characters who act just as you would expect rather than as a plot would demand. The group dynamic has been judged just right and this all acts as a very effective draw to the book and story. There really is a wonderful vibrance about the prose which has a much more positive air than many modern novels, something that makes a refreshing change and manages to avoid coming across as naive as can often be the case. I loved reading more about these huge Fellhounds and for me they are the real highlight of the novel and my wish of learning more about them after reading the last book has thankfully been granted. If I had the space and time I would quite gladly adopt one of these Irish Wolfhounds upon which the Fellhounds have been based. Moon Crossing is perfect for any Young Adult fan of fantastic fiction, a wonderful blend of interesting characters, vivid backdrops and an intelligent story all weaved together into a magical tale. Written on 20th July 2012 by Ant.